Each user can make posts to their Feed which their friends can also see. 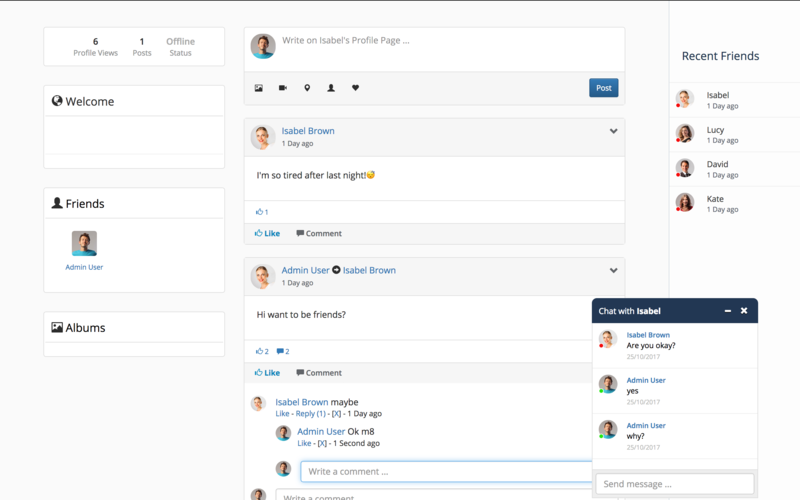 Feed Posts can be made with the Feed Editor, that allows you to make emotive responses. Upload Images directly from a post. Users can share posts from other users to their own feed. Tagged users using the @mention symbol. Choose a location powered by Google Maps to let people know where you are. Tell everyone who you’re with by mentioning users in your posts. Can turn off notifications for individual posts. Save any post to your list of Saved Posts. Edit/Delete any post on the fly. Show albums of images with gallery viewer. 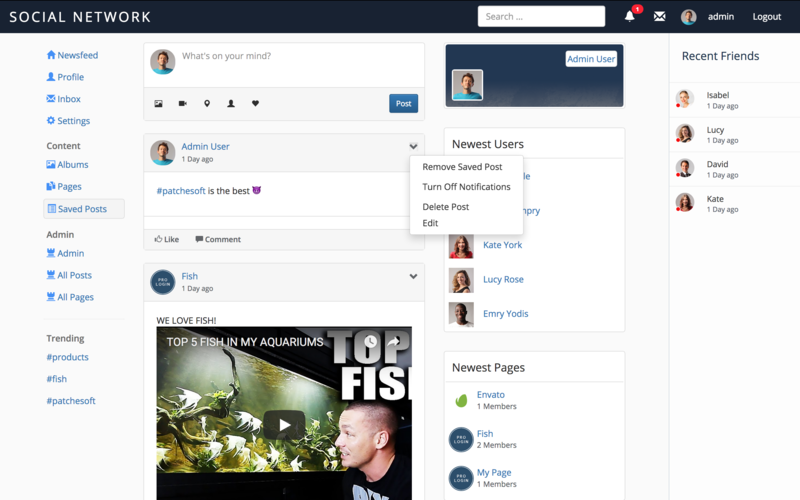 Frontpage will show posts from all your friends and pages you’re a member of. Admins have access to All Pages and All Posts sections. Saved posts displays any posts you have saved. Sidebar shows your most recent online friends. Display Adverts; Rotation adverts will show a random advert until it’s pageviews reach zero. 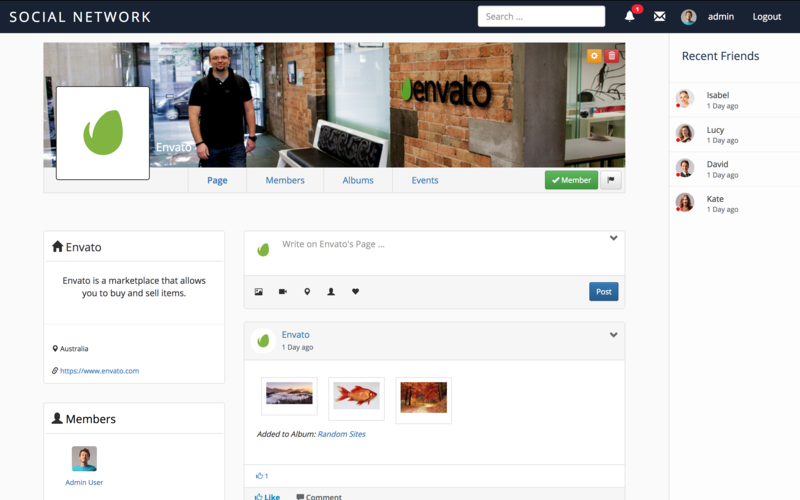 Users can create their own blogs and blog posts. Blog posts can be public or private(friends only). 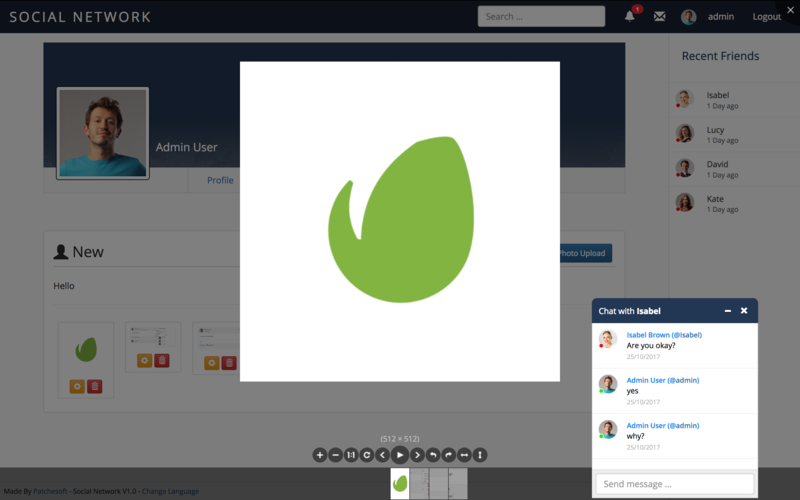 Users can share their blog posts to their feed. Can be enabled/disabled from the Admin Panel. Blogs section shows list of new public posts to everyone. Admins can edit/delete all blogs/blog posts. Can have multiple chat windows at any time. View all chats in the Inbox, as well as reply/create new chats. Clicking on a friend in the sidebar will load up their chat window automatically. Users can also register accounts using their Social Network(Google, Facebook, Twitter) accounts, making it even quicker to sign up to your site! User notifications, including email reminders. Profiles contain all posts made by that user. Other users can post directly to the user’s profile. 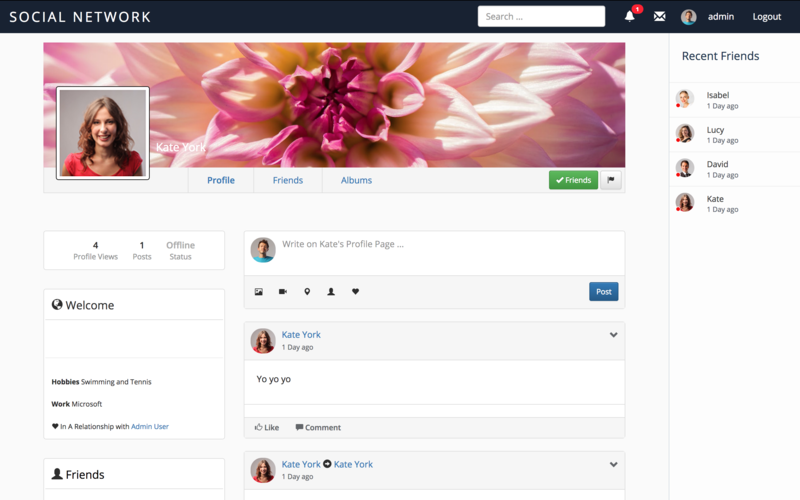 Profiles show off the user’s friends list and albums they have created. 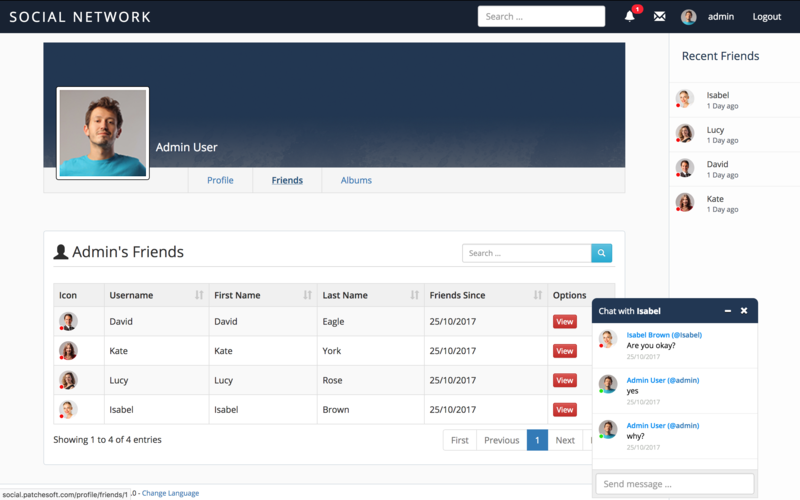 Custom Fields for each user can be made in the Admin Panel to show up on the profile. Any user can be reported, with reports being sent to the Admin Panel. 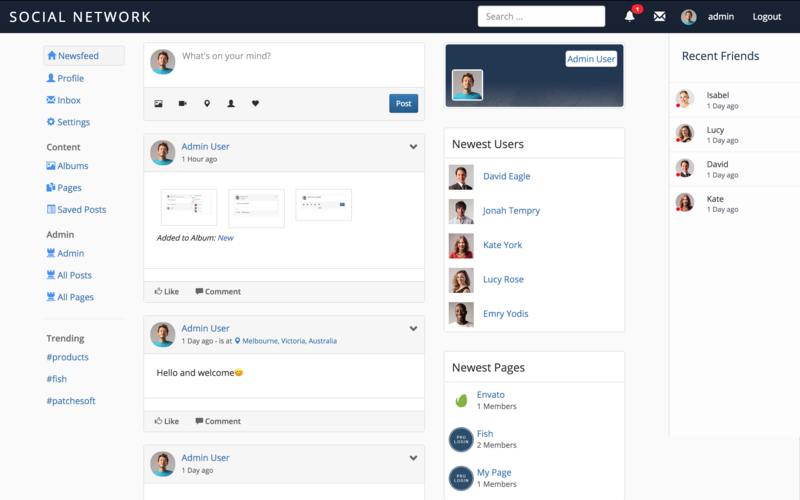 Users can create custom pages with the User Role Page Creator. Each page has it’s own members section, albums and events calendar. Pages can be set to private/public so that only certain users can see/view them. Members of Pages can have their Page Role set to Admin to help update the page. Invite Members to join your page. Albums allow you to organise photos and images better. Events section allows you to post an Event on your page, with details such as time, location etc. Events can be marked as attending/not attending. Post events to Page Feed. Any page can be reported, with reports being sent to the Admin Panel. Users can purchase credits to use on the site. Users can purchase a Rotation Ad space. Display their own advert on the site. Users can promote a post for X amount of pageviews where the promoted post is displayed on the frontpage. Users can purchase a verified sign icon. Admin can approve of all submitted Promoted Posts/Adverts. See Payment Logs in Admin Panel. Search Members by username, first name, last name, email. Privacy settings which allow the user to set who can see what and perform what actions. Add their social network profiles for other sites. See page invites and friend requests. View reports of bad profiles/pages. Manage Rotation Ads, Promoted Posts and Verified Requests. Manage Advert settings, including controlling pricing of adverts. Improved the way links are handled in posts. Added option to allow non-logged in users view profiles and their albums. Added option to allow non-logged in users to view pages and their albums & events. 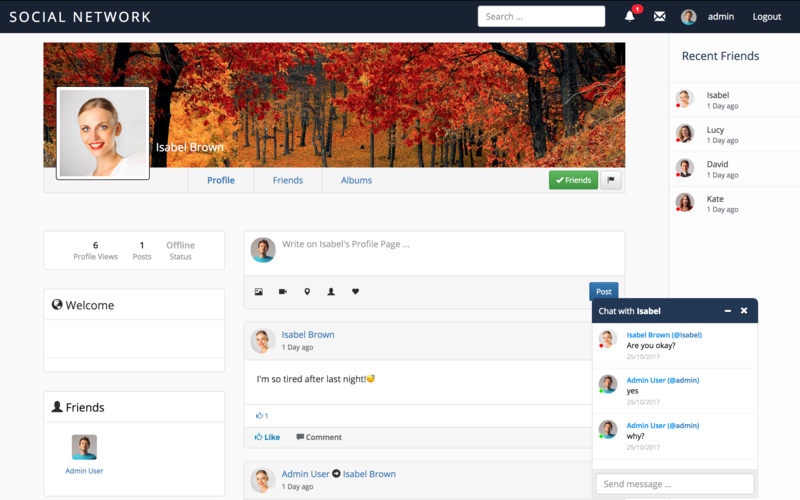 Users can create their own blogs, make posts and share it to their feed. Added new Rotation Adverts feature that allows you to add Adverts to the site. Admin can manage Rotation Adverts in Admin Panel; Accept/Reject, set price for pageviews, view active adverts. Users can purchase a Rotation Advert that is displayed on the site using Credits. Users can pay credits to promote their posts to everyone’s dashboard for X amount of pageviews. Admin can approve/reject all promoted posts. Implemented User Polls; users can now create a poll when making a post. Select from Multiple Votes or Single Votes. Users can also submit Verified Requests from the User Settings page. Option to disable this added in Admin Panel.